Say welcome to the Nomad Lane Bento Bag into your world to make it comfortable, This latest personal item bag. It’s lightweight, charges your phone, slides over your carry-on roller and has easy access pouches for all your in-flight gear. In innocent words This affordable bag makes your life ease. The Bento Bag was invented to fit under the seat in front of you so you have easy access to in-flight essentials (toiletries, medicines, devices, chargers etc.) when mid-air without having to get up from your seat or reaching for the overhead bin. The Bento Bag is 17” x 10” x 8” or 44cm x 25cm x 20cm (more sizing details below) and fits the definition of a personal item bag for most U.S. airlines. The bag fits under standard economy seats. Rather of digging through your bag at security, the Bento Bag has specially designed pockets for the things you need to reach quickly. 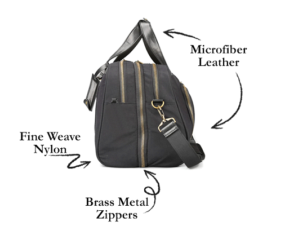 There is a built-in padded laptop pocket at the middle of the bag that can quickly be reached via the top access zippers. It also has two top access pockets that can hold your toiletries and tech gear. The Bento Bag has a carry-on sleeve so it slides over your luggage which is notably convenient for long airport treks. The external front pocket of the Bento Bag enables you to easily reach things you need, like your passport, phone, and keys. This pocket includes four stretchy pockets, 1 passport pocket, 3 pen slots, a zippered cash pocket, and an attached key leash. Gone are the days of expending your most valuable possessions in the runway shuffle. A low battery may be remarkably disrupting, particularly when you are moving. That is why we built easy access charging port for your devices within the bag. Pop in any standard battery pack and you are ready for a day on the road. =>Fine Weave Nylon: The exterior of the Bento Bag is constructed with a lightweight fine weave water-proof nylon. =>Metal Zippers: All exterior zippers are extremely durable and stylish brass metal zippers. =>Microfiber Leather Accents: The kit handles and straps are crafted with the luxury microfiber leather. Microfiber is an innovative leather replacement that is animal-friendly. It also weighs less and has the same tear-resistant properties as leather. =>Metal Feet: The Bento Bag includes metal bag feet to keep your bag off the dirt, which comes in handy for sticky situations like airport bathrooms. 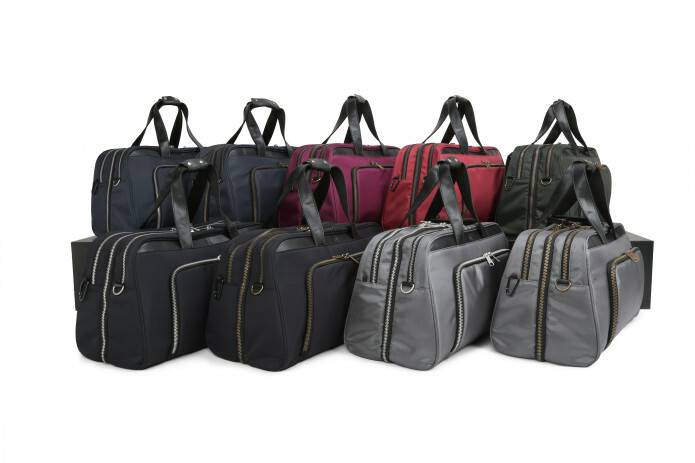 The Bento Bag comes in six shades: Jet Set Black, Nomad Navy, Tarmac Gray, Bordeaux Burgundy, Juniper Green, Positano Plum.